Neighborhoods: Austin, Hyde Park, Lakeway, Westlake, Barton Creek, Barton Springs, Allandale, Northwest Hills plus many more! Welcome to Premier Pet TLC! We are the award winning, first-class TLC pet care provider and cat behavior modification specialists in Austin. 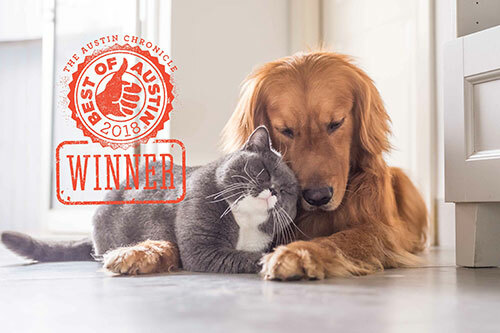 Awarded Best of Austin 2018 by The Austin Chronicle, our all-inclusive pet sitting services start at $25 and includes all your household pets, cleaning & replenishing water and food bowls, tidying up your pet’s food & litter area, litter love, insulin and medication administration, light altering, opening/closing your blinds, plant care, mail/newspaper collection and taking out the trash/recycling. Become part of our family, and let us take care of the details! We also offer personalized cat behavior modification planning, pup strut aka dog walking, wedding & special events and pet taxi. We are licensed, insured and bonded. All of our pet caretakers are cat behavior, dog behavior and pet CPR & first aid certified! Send us an email to schedule your complimentary meet and greet at [email protected] or call/text 833-4PETLUV today!